As a high school All American, Pat went on to be the four year starter at St. Louis University, and still second in all-time saves at SLU. Drafted in 1985 to the Tacoma Stars, he soon returned to St. Louis to mind the nets for the St. Louis Steamers from 85-88. Once again giving back to the game, Pat was the assistant coach for the Flo-Valley National Champs in 88 and 90 and runner-up in 89. He was also the assistant for the Incarnate Word State Champions of 89 and 92 and third place in 90 and runner-up in 91. While coaching, Pat found time to continue playing for Gaffney’s in the CYC and the Kutis O/30 team with an championship and second place twice. A product of the NORCO Organization, Bill went on to Lewis-Clark and then to Sangamon State University taking the NAIA National Championship in 1986 while being named to the All-Tournament team and MVP and All-American honors. While playing in the College World Series of Soccer, he also was selected to the All-Tournament Team. 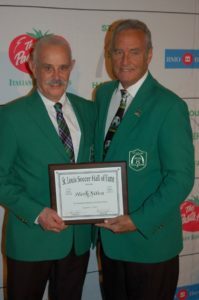 IN 2014 Bill was inducted into the University of Springfield/Sagamon State Hall of Fame. After college Bill played outdoor in the APSL with the Colorado Foxes and indoor with the Fort Wayne Flames, New York Kick/Hersey Impact, the Harrisburg Heat for 8 years, before returning to the St. Louis Ambush for a year. Bill began coaching as an assistant at Lewis-Clark for 8 years and the east coast called him to Elizabethtown College for 2 years. Since 2004 to the present, Bill has been the coach of the Harrisburg City Islanders of the USL. Twice named coach of the year, USL 2 time Champions, USL Pro National Division Champions, reaching the quarter finals of the US Open Cup 4 times. 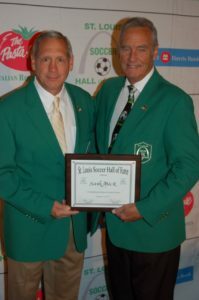 In 1996 to the present, Bill is the Director of Coaching for the Lower Dauphin Soccer Association and LDC United Premier Youth Soccer Club with over 1000 players and 65 teams. One of the most prolific players of his time and accomplished so smooth and efficient that no one realized it until the match was over. Starting with the Florissant Celtics Jr Cup Champions and on to Western Illinois U where he was the team MVP. After that first year, Sam transferred to Quincy and the impact was immediate with two NAIA National Championships, All-American honors, voted Best Defensive Player in the Senior Bowl and culminated in being chosen to represent the US on the National Team. 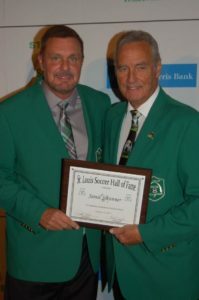 Sam’s professional career started with the Minnesota Kicks in the NASL when they finalist in 1976, then moving to the San Jose Earthquakes for a couple of years before returning home to the St. Louis Steamers Indoor Team. Two time MISL All-Star, two time MVP for the Steamers, and the team was finalist four years while Sam was with the team. Sam continued playing out door and ended with an Over/30 National Championship with the Bud Over/30 team in 1988. Sam is also in the Quincy College Hall of Fame and the NAIA Hall of Fame. A product of the Gene Baker (HOF 1997) and Ruben Mendoza (HOF 1984) years in the Granite city area, Keith started his college career at the University of Washington and transferred to Rockhurst to complete his college. While at Rockhurst, Keith was named the team MVP, Outstanding Back and a member of the All-Tournament Team, and First Team NAIA All-American honors. After college, Keith began his professional career with the Wichita Wings for four years and then to the California Sunshine, Albany Eagles, Rochester Flash and ending with the Oklahoma City team all in the ASL. Returning to St. Louis, Keith played with the Kutis SC and the Ramsdale FC where he was a Region 2 champion and National Semi-Finalist. Keith was inducted into the Granite City Sports Hall of Fame in 1995 and the Rockhurst College Hall of Fame in 2006. The talented player, turned talented coach, that has now turned into one of the most sought after individuals in the state of Missouri for his methods of coaching and teaching the game of soccer. As a player, Tony was non-stop. Playing for Amateur teams the Lindberg Cadillacs, St. Louis United, CSMAC, Busch White Star, St. Louis Kickers, a summer in Reutlingen Germany playing, Gianinos, PNA, Kutis Collegians, Imo’s, Super Star Sports, Mastercraft, Soccer Dome, and Kutis Veterans Cup Team. 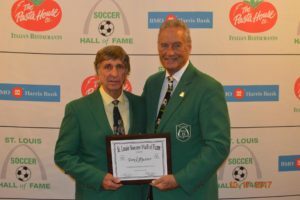 During the initial years of the NASL, Tony was on the Taxi squad for the St. Louis Stars in 1968. Tony’s coaching career actually started while he was still playing. PNA, Imo’s, Super Star Sports and Mastercraft led to a couple of years at Pattonville H.S., then to Webster University, Forest Park CC, Soccer Dome, and the MO. Senior Men’s State Team. This all led Tony to become the Director of Coaching for MYSA that led to a full time position from 1982-1995. 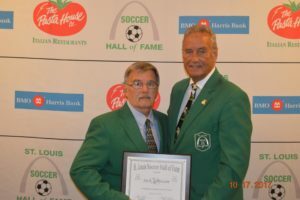 In addition to these responsibilities, Tony was Region II USYSA Staff Coach for Boys and for 14 years Tony was the coach for boys and girls at DeSoto High School. One of the most respected names officiating the game of soccer in the United States. 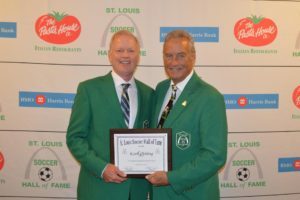 Herb’s credentials starting from the local state level as the VP of the Missouri Soccer Association, National Intercollegiate Soccer Officials for Assessing and Camp guest lecturer. 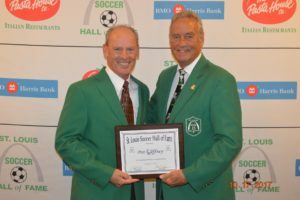 United States Soccer Federation, Director of Referee Identification and Training, National Instructor, National Assessor, Indoor Referee, Youth Licensed coach, recipient of the 2006 Eddie Pearson Award, and National Referee Emeritus. FORMER: Director of Professional Referee Department, Associate Manager of Assessment and Training, from 1997-2002 Manager of Professional League Referee Assignment and Assessment, Coordinated Professional Leagues (MLS,NASL,WUSA,USL) along with Federation Assignment and Assessment, designed and implemented the professional assignment website. USSF National Referee as NASL, MISL/MSL full time referee, CISL AND WISL Assignor. A USSF National Referee Committee representing the Professional Division and lastly, NISOA NCAA Referee. Let’s start with the son of Pete (HOF 1988). 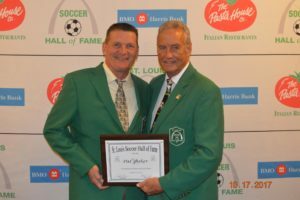 A product of both Scott Gallagher and the Busch Soccer Clubs, Mike attended St. Louis University where he was a member of a Final Four Team and a Hermann Award Finalist in 1992. From 1992-1998 Mike was a member of the United States National Team garnering 67 Caps. Mike was a member of the starting 11 and was mentioned as the steadiest player on the field whenever he wore the colors of the National Team. Mike was a member of the Pumas in the Mexican League from 1994-1996 where he was named a member of the Mexican League All-Star Team, the first American named with that honor. Returning to the US in 1996, Mike played for Kansas City, New York Metrostars, and Chicago in 2000, winning the US Open Cup and MLS Runner-up that year. 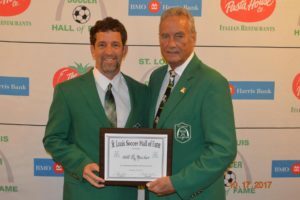 Mikes’ knowledge of the game has led him into the coaching arena, from 2001-2006 he was the Assistant at SLU and once again, the US National Team called him to be the assistant coach from 2007-2011 making him the only American to play and coach in a World Cup. Accomplishments while with the National Team include Gold Cup Champions in 2007, Confederation Cup and Gold Cup Runners-ups in 2009, World Cup 2010 first in their group, and in 2011 Gold Cup Runner-up. After assisting with the Montreal Impact, Mike moved to the Philadelphia Union in 2014s, taking them to the US Open Cup final in 2014, where he continues as the assistant coach today. While first attending University of Indiana at Evansville, Jamie transferred to Clemson University where he received All-American honors and was voted top collegiate goalkeeper of the year. 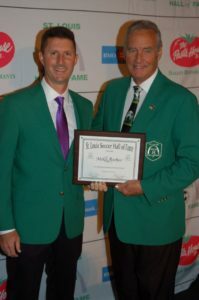 A two sport athlete, Jamie chose soccer over baseball when he was selected to the US Olympic Team in 1984, a call to the National Team, and the First National Futsal Team. Drafted by the Cosmos in the NASL, he never really got the outdoor start. The NPSL Indoor League was his next step. Rookie of the Year in 1985 with the Canton Invaders, Jamie was the goalie for 4 Championship years with Canton. 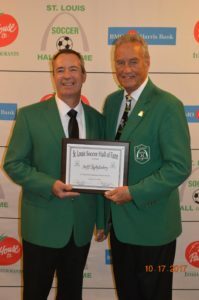 Later in 1995, he received his fifth Championship with the St. Louis Ambush. Received 6 Goalkeeper of the League Award, 2 MVP Awards, 11 All-Star Games and was named MVP twice. Recorded 296 Career Wins and had 9 goals and 98 assists as a goalie. From the Canton Invaders, Buffalo Blizzard, St. Louis Ambush, and the Kansas City Attack. Once again, giving back to the game, Jamie has helped with the NORCO Soccer Club, Scott Gallagher Illinois, McKendree University, and the cities of O’Fallon and Wentzville. Currently, Jamie is the assistant coach for the St. Louis Ambush. Jamie is also associated with the Friends of Kids with Cancer, Special Olympics, and The Climb for PTSD. Jamie is the Owner and Operator of the CORE Soccer Training, developing programs for individuals and coaches on a one on one or a team basis.